The Gold Report: You singled out negative bond rates and a downward New York stock market as two of the factors that would make gold look more attractive in 2016. What are the other forces pushing gold to the $1,200 an ounce ($1,200/oz) level? Eric Coffin: I think we're simply getting to the end of the gold bear market. We may just be running out of sellers. I think all of the hot money—and even the warm money—is pretty much out of it. Most of the funds were completely out by late 2015. That's part of the reason why I suspect that even though the major markets in New York are likely to fall at least 20% from the highs this year, I don't expect a repeat of 2008 and the wholesale selling in gold stocks. Back then, gold and gold stocks bottomed four months before New York did but that came after selling that ended a multiyear bull market. Everybody and their dog owned gold stocks heading into 2008. At the start of 2016 "nobody" owned them. I don't think we have a similar situation where a fall in New York means gold stocks get thrown out like the baby with the bath water. I think this time around you'll actually see more buying than selling because most traders are still very underweight gold stocks and gold itself, for that matter. Plus, central banks seem to be running out of rabbits to pull out of their magic hats. Some hedge fund managers are expecting Quantitative Easing (QE) 4. Maybe we'll see it, but Congress would go nuts if the Federal Reserve announced another QE program during an election year. There is a chance of a return to near zero rates later this year in the U.S. We already have negative rates in some countries. There's no indication that's going to change any time soon. The European Central Bank is making noises about going even more negative, and Japan may too. I don't think this is a short-term thing; it's a trend that's going to take a while to resolve. That's positive for the gold market. 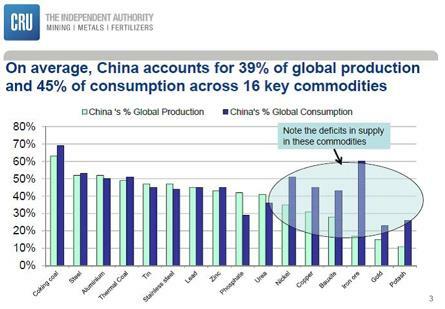 TGR: How big of a factor is China for gold and other commodities? EC: Gold is a funny market. There's a large contingent of traders and most trading occurs in the futures market where it's paper rather than actual bullion changing hands. It's hard to argue that physical gold buying in China, India or anywhere else matters when trading volumes in the futures markets are so much larger and drive the price most of the time. That said, there is no doubt that saleable global physical gold supply has been shrinking for some time. Gold generally moves from West to East and gets put into people's safety deposit boxes and central bank vaults. The day may come where that movement is large enough that it's really going to start pushing the price. I don't think there's a lot of doubt that central bank buying and buying out of China is taking all of the annual production and then some. Plus, I think we've seen peak gold production for the foreseeable future. We're far enough now from the highs of the gold price and the funding capital expenditures (capex) for new mines that I don't think we're going to see growth in mine production now for probably several years. All of those things are positive. TGR: Are you anticipating that because of the lack of investment in exploration over the last few years, the gold mining equities will outperform the price of the metal? EC: Normally, when you get a trend change like this, the miners tend to be more volatile and have higher beta than the actual underlying commodities. So I think it's reasonable to assume that if the metal price goes up, say, 25%, select gold equities could go up 100%. I would expect the gold miners to significantly, in percentage terms, outperform the gold price on the way up. That's normally how it goes. TGR: Will some do better than others? EC: In percentage terms, if you're 100% convinced that gold is going to be, say, $400/oz higher next year, theoretically you'd probably get your biggest percentage gains from the really crappy miners that are very marginal right now. If they are on death's door and priced that way, a big move gives them a new lease on life and they should see the biggest gains. I don't argue that logic but I have always had a philosophical issue with following the really crappy miners. I prefer to follow companies that have strong management and the best-looking projects. That gives me some downside protection if the commodity they mine doesn't have a big short-term move. But if gold goes up 20% from here, which I don't think is an unreasonable target, and builds a new base around $1,200/oz, the next target on the upside is $1,500/oz. With that kind of a move, all the miners will do really well. TGR: What are some examples of quality companies you think could outperform? EC: I don't follow a lot of the producers in the newsletter since there is so much existing research on them. Goldcorp Inc. (G:TSX; GG:NYSE) has been on the list since it took over Virginia Mines. It will have a good run. Agnico Eagle Mines Ltd. (AEM:TSX; AEM:NYSE) is a very well run company, and I think it will continue to do well. Some of the miners with projects outside the U.S., like Goldcorp, Agnico Eagle, Richmont Mines Inc. (RIC:NYSE.MKT; RIC:TSX) and Claude Resources Inc. (CRJ:TSX), have had some added lift from the fact that the bulk of their production is in Canada. They're selling gold at $1,600/oz in Canadian dollars and benefitting from the lower Canadian cost structure. Some of the South African and Australian companies are in similar situations. Assuming my thesis about a weakening U.S. dollar this year continues to hold, I wouldn't expect to see a lot more drop in the Aussie and South African currencies. Canada might get a little more drop if the oil price does badly. We may see less outperformance from "non U.S." names going forward if they don't get more currency tailwinds. Continued increases in the price of gold in U.S. dollars should really help more U.S.-based producers like Newmont Mining Corp. (NEM:NYSE). Relative to other producers, Barrick Gold Corp. (ABX:TSX; ABX:NYSE) or Newmont is going to get more advantage out of the gold price going up $300/oz in U.S. dollar terms. TGR: Do you anticipate more mergers and acquisitions (M&As) once things start to look up? EC: Probably. Companies have had their heads handed to them for the last three or four years for some fairly stupid and expensive M&A. But when a sector gets hot, M&A always seems to come back. I would think some of these companies also need to restock their project pipelines. None of them really wanted to do deals with cheap stock, but if their stock goes up 50% or 100% and they view it as being expensive currency again, I think you'll see M&A lift again. The market has a short memory. Toronto Subscriber Investment Summit on March 5, 2016. TGR: What does your thesis on China mean for copper? EC: China has been a huge negative for base metals. It is negative in actual terms—changes in demand—and even more so in sentiment terms because traders fear the slowdown will worsen. But the actual import numbers for December 2015 show imports of finished and unfinished copper into China were the second highest month in history. Copper inventories are not really that ugly. It is always difficult to know what to believe when it comes to Chinese economic readings, but based on the current supply/demand structure, copper probably gets significantly better going into next year. There is a lot of concern about supply growth, but in my experience, mines never get built as fast as predicted. That is why I'm pretty skeptical of the projection of a 6% or 7% increase in copper supply in the next couple of years. I don't see copper prices getting much below $2/pound ($2/lb) and staying there for very long and, if China doesn't really decelerate this year, we could see some price gains by year-end. I've been mildly bearish on copper for two or three years. But I think the worst is over. TGR: Are you still following some copper stories? EC: I follow Excelsior Mining Corp. (MIN:TSX.V), which is working on permitting an in situ recovery (ISR) copper project in Arizona, which has very low capex and pretty low operating costs, too. It basically has to finish its feasibility and get through permitting, which will take a year or two. But the numbers for its Gunnison project are very strong. It's trading at a tiny fraction of its net present value. Earlier stage, I'm following a couple of exploration stories. One that I like is Arena Minerals Inc. (AN:TSX.V), which has a very large property position right in the middle of the porphyry belt in Chile. It has optioned out most of that to three majors—Teck Resources Ltd. (TCK:TSX; TCK:NYSE), B2Gold Corp. (BTG:NYSE; BTO:TSX; B2G:NSX) and Japan Oil, Gas and Metals National Corp. (JOGMEC). There is little outcrop exposure and the local cover material makes both traditional geophysical and geochemical methods unreliable for targeting. This is basically blind drilling based on structural studies and geologic inference. It's like playing Battleship with a drill. JOGMEC looks as if it has hit the edges in a couple of porphyry systems. It is in the midst of permitting another 280 holes. Teck is drilling and should be reporting over the next month or so. I believe B2Gold begins drilling again next month. That's part of what I like about it. It's going to have huge news flow all through the year and the target scale is large. This is elephant country. TGR: What are some other copper companies you are following? EC: A company that has been at a couple of our Subscriber Investment Summits is NovaCopper Inc. (NCQ:TSX; NCQ:NYSE.MKT). It's a spinout from NOVAGOLD (NG:TSX; NG:NYSE.MKT) with a number of large, high-grade copper projects in Alaska. They're very impressive projects. Alaska is a good place to mine because it has the state and the local native corporations on its side, so it's one of those when-not-if stories. It is just going to work its way through the permitting and getting a road constructed. Tens of millions of tons of 4% or 5% copper are there. There aren't many deposits like that around. Nevsun Resources Ltd. (NSU:TSX; NSU:NYSE.MKT) is another company I've followed for years. It has the Bisha mine in Eritrea. Currently, it's classified as a copper producer, but by the time we get to year-end, it's going to be 50/50 copper/zinc, in term of revenues. Bisha is very high grade. I don't think Nevsun is making a lot of money at $2/lb. I don't think anybody is making a lot of money at $2/lb, but I think it is generating good cash flow, and the company is debt free unlike most of its competitors. It has about $3/share in working capital and it's only a $4 stock. Nevsun is one that I've had on the list for a long time because it started out as a gold producer when the gold prices were really high. Bisha shifted to copper-dominant production just as the copper price went to $5/lb. I think zinc is going to have a pretty good year next year. By the time that rolls around, Nevsun is going to be a big zinc producer. It is still drilling off discoveries on the property close to Bisha and expanding the Bisha resource itself and could be mining for 20 years. It also has a lot of potential to be an acquirer. It just hasn't found the right thing yet, but it has CA$600 million (CA$600M) in cash on the balance sheet. I personally think if that cash pile keeps growing, it is also a takeover target because even if an acquiring company isn't crazy about Eritrea, it's not a very high-risk takeover play when you're getting $600M and no debt as part of the deal. Meet companies like Nevsun, NovaCopper and Arena Minerals at the upcoming Toronto Subscriber Investment Summit on March 5! TGR: Silver did not outperform when gold jumped at the beginning of this month. What does that mean for silver mining companies? EC: It means times are a little bit easier but not a lot easier just yet for silver mining companies. It's gone up some, but at the prices prevailing a month ago, I think you'd be hard pressed to find many companies that were making money. Silver is not viewed as a currency. Silver does have a big industrial component, so when commodities in general are getting sold, it's going to have more of a problem fighting that pro-cyclicality. If gold prices get positive enough, at some point during that move I would expect to see a larger percentage move in silver simply because some people who are looking for precious metals will jump on that. And it's a much smaller market. It's a market that can get moved a lot farther percentage-wise. At some point the silver people are going to get some joy out of it, but I just don't think it's a natural asset class that gets bought when markets are uncertain. TGR: Are there some specific silver companies that could do better than others? EC: One company I added was First Majestic Silver Corp. (FR:TSX; AG:NYSE; FMV:FSE). Currently, all of its operations are in Mexico. Because the peso is one of the currencies that struggled against the U.S. dollar, that has benefitted First Majestic. Virtually all of its operational and management personnel are based in Mexico and are Mexican nationals. Those people know what they're doing. First Majestic has a very good balance sheet without a lot of debt. It has a couple of revolving lines that it can use for takeovers later if it wants. It took over SilverCrest Mines late last year. That's when I added it to the list. That gave it a little bit more gold weighting, which I think is going to help it even more. It has been a good growth story. I still follow the spinoff company from that transaction, SilverCrest Metals Inc. (SIL:TSX.V), which will be presenting at the subscriber summit as well. It's basically a management story. I also like the two gold-silver exploration projects. The one that it looks like it is going to focus on, Las Chispas, has a lot of history but hasn't seen a lot of work for decades. It's a Mexican project that has been on the back burner for 60 or 70 years. Historically, it was an extremely high-grade producer. I'm hoping the company will be drilling by the time that the subscriber summit starts. The company is trading at about its cash value right now. There is really no exploration bonus on this thing at all, so per share you're basically paying what's in the bank account. And you are getting for free the team that built SilverCrest Mines and sold it for $150M. In an emerging bull market, that is the kind of team you want to get behind. TGR: Why have oil prices turned out to be a depressant rather than a supporter of the overall stock market? Shouldn't lower energy prices help most companies? EC: They do in theory. The problem is that you have to get past the fact that the oil sector is a pretty important one. When that entire sector has been decimated for two years, that's a big drag on the equity indexes before you even start looking at what it does for the rest of the economy. Also, it doesn't seem that the American consumer is spending this effective tax break from low oil prices. There is a school of thought that says those savings are just getting eaten up by things like higher medical costs so they're not turning into discretionary spending. Wall Street also underestimates the importance of the oil and gas sector as an employment driver. I've seen estimates of the employment loss from the falling oil price of about 100,000 jobs. Those are not waitress jobs. These are people getting paid $50 an hour. That's been depressing the average wage and keeping the country from seeing a wage gain everybody expected when the unemployment rate hit 5%. That's just my pet theory. Plus, the U.S. simply isn't a big oil importer anymore. So it didn't do as much good for the U.S. economy as it might have for, say, the European economy, which is not a significant oil producer. TGR: Do you see oil prices turning around in 2016? EC: I think probably before the end of 2016. They have had a nice bounce here. Turning around? Yes. Are they really going to go very far? I have trouble envisioning the oil price getting much more than $35–40 a barrel ($35–40/bbl) this year unless there is actually some kind of an agreement between OPEC and Russia, cutting production by 2 or 3 million barrels a day. I think it would take something that dramatic to give oil a big move because there are massive aboveground inventories now, and they're still growing. I'm not sold on the idea that we're not going to still see a little lower oil price before we see a higher one. I don't see oil above $50/bbl for a couple of years. TGR: Do uranium prices depend more on oil prices or reactor restarts in Japan, and construction in China and India? EC: Short term, you seem to get moves in the uranium price based on the oil price swings, which makes no sense to me whatsoever. I see no reason why there should be any connection at all. They are very different things, and the timelines are so long in the uranium sector that the price of a barrel of oil should be irrelevant to buying a contract to fuel a nuclear reactor. But when you get big swings in oil, it seems to affect uranium prices at least on the edges. The bigger thing for uranium is it also has aboveground stock that has to get worked through. That's going to take a couple more years. After Fukushima, when essentially the entire Japanese and German reactor fleet was shut off, that added a lot more aboveground stock. That's probably going to take another two or three years to work off. That said, I don't think it will take two or three years for the price to start to move because the utilities tend to want to lock in supply years in advance. When you're running a reactor, you want to be running it near capacity. Reactors are so bloody expensive to build and operate, you don't want to be running them at 50% capacity. Paying an extra $20/lb for uranium is negligible in what it does to your operating costs. Forward charts of what's contracted for by utilities fall off in the next year. I think as we get later into this year and into next year, there are going to be more utilities saying we want to know we're going to have these deliveries five years out, so we're willing to pay up a bit to make sure we have those. On the other side, with prices at the current $33–34/lb level, there is going to be virtually no production growth whatsoever. Even the ISR guys are essentially trading dollars for dollars. Those projects don't get capitalized at $35/lb unless you have a government of Korea or China that doesn't really care what the price is. They just want to know they're getting the supply security. TGR: Because the timeline for exploration and permitting is so long term, are there some companies that you're following because they might be ready when the market does turn? EC: I'm really only following one uranium stock. That's Energy Fuels Inc. (EFR:TSX; UUUU:NYSE.MKT; EFRFF:OTCQX). The company has ISR production and a little bit of conventional production tailored to meet existing long-term contracts. The long-term price of most of its contracts is about $55/lb. It makes a bit of money at that. Energy Fuels has just expanded its ISR production a little bit, but it is also in the middle of permitting two larger resources. It owns the only conventional uranium mill in the U.S., and it can take advantage of a price move. Uranium is one of those funny markets where if things start to move, it could move quickly, so I wanted to be positioned in something where I felt we were getting a really good price. I wrote it up at $2.50/share in December because it had a pretty bad tax-loss season. It's trading at about CA$3.30–3.40/share now. If we do get a spike and the price goes up to $70/lb, Energy Fuels is in a position to sign long-term contracts and actually deliver uranium into those contracts. It's probably going to do 800,000 lbs this year, but it could take that up to a couple of million pounds fairly easily with very little capex. It would just be a matter of starting to produce from these small conventional deposits and feeding them into the mill it already owns. One uranium company that will be at the subscriber summit is NexGen Energy Ltd. (NXE:TSX.V; NXGEF:OTCQX). It is one of the most impressive uranium discoveries in history. It is going to come out with its initial resource later this year, and from the looks of things, it could be at least a couple of hundred million pounds of high-grade ore. It's a pretty spectacular deposit. And it looks as if it could potentially be a lot bigger than that. NexGen routinely puts out unbelievable drill holes, of up to 40 meters of 8% or 10% uranium. We don't see drill holes like that anywhere but in the Athabasca. It's one of those projects that some company is going to feel it has to own. It's just too impressive a project not to get bought by somebody. TGR: Tell me about the summit and what you hope the attendees will take away from the event. EC: The Subscriber Investment Summit will be held in Toronto on March 5, the day before the PDAC Convention starts. It's at the Hilton downtown. Keith Schaefer, Tommy Humphreys and I will be doing short presentations on where we think the market is going. We also have three pretty interesting guest speakers. One of them, an energy expert out in the U.S. that Keith swears by, heads an extremely expensive institutional service, so that will be pretty exclusive. The other two people are hedge fund managers. One of them has some pretty pointed things to say about a number of oil and gas companies. The other person made a name for himself shorting Bre-X. Plus, some 15 companies will be presenting. I'm hoping attendees come away with a set of really good ideas for a market that is bottoming. The worst is probably just about over. So now is the time you want to hear from mining CEOs. There are two hours of catered lunch breaks and coffee breaks, plus a cocktail reception after the show so investors will have plenty of time to talk to the CEOs and get questions answered. Everybody walks away with a set of all the day's presentations on a stick. You should be set up to be able to narrow it down to three or four deals to put on your radar screen. It's a very strong set of companies. What differentiates the Subscriber Summit from a lot of the other resource conferences is that it is a curated list. The companies have to be invited by the newsletter writers. And we turn away a number of companies at every one of these shows. We limit attendance to no more than 300 people. Because the attendees are also invited—most of them are off the subscriber list for the newsletters—you don't have 5,000 people who are running in there, trying to grab pens and squeeze balls. It's a couple hundred people who are there because they actually buy this stuff. They're there to do deals and they're serious. They find the Summit is a great networking opportunity, not just with the companies but also with other investors like themselves. TGR: Thank you for your time, Eric. Eric Coffin is the editor of the HRA (Hard Rock Analyst) family of publications. Responsible for the "financial analysis" side of HRA, Coffin has a degree in corporate and investment finance. He has extensive experience in merger and acquisitions and small-company financing and promotion. For many years, he tracked the financial performance and funding of all exchange-listed Canadian mining companies and has helped with the formation of several successful exploration ventures. Coffin was one of the first analysts to point out the disastrous effects of gold hedging and gold loan-capital financing in 1997. He also predicted the start of the current secular bull market in commodities based on the movement of the U.S. dollar in 2001 and the acceleration of growth in Asia and India. Coffin can be reached at [email protected] or the website hraadvisory.com. 2) The following companies mentioned in the interview are sponsors of Streetwise Reports: NOVAGOLD, Energy Fuels Inc. and NexGen Energy Ltd. The companies mentioned in this interview were not involved in any aspect of the interview preparation or post-interview editing so the expert could speak independently about the sector. Streetwise Reports does not accept stock in exchange for its services. 3) Eric Coffin: I own, or my family owns, shares of the following companies mentioned in this interview: Excelsior Mining Corp., Arena Minerals Inc., Nevsun Resources Ltd., SilverCrest Metals Inc. and Energy Fuels Inc. I personally am, or my family is, paid by the following companies mentioned in this interview: None. My company has a financial relationship with the following companies mentioned in this interview: None. I was not paid by Streetwise Reports for participating in this interview. Comments and opinions expressed are my own comments and opinions. I determined and had final say over which companies would be included in the interview based on my research, understanding of the sector and interview theme. I had the opportunity to review the interview for accuracy as of the date of the interview and am responsible for the content of the interview.